I have some sparkles to show you! The glitter I am sharing today is a glitter that caught my eye quite some time ago. I can't even remember... maybe 6 months or so? Anyway, I passed it up because I didn't want to spend $9 on a glitter, much less a glitter that makes me fish it out of the bottle. HOWEVER, I couldn't stop thinking about it. If you're not a HUGE fan of nail polish like I am, that will sound nuts, but I'm serious. So I finally purchased the glitter... and I don't regret it. Thank you very much. The first photograph is of the base color that I decided to use. 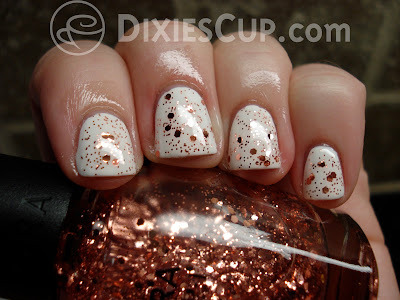 I swatched this glitter on about 9 different colors to see which one would show it off the best and I ultimately decided to go with a clean, crisp white. The photo above is 2 coats of Finger Paints Paper Mache on top of 1 coat of base coat. No top coat. Application of this color is pretty easy, however, it seems to dry very slowly. I ALMOST decided to just stop at this step because the plain white nails were quite pretty. If you keep reading, you'll notice that I couldn't resist the sparkles. What you see above, as well as all of the photos that follow, is an attempt to show how pretty this glitter is. 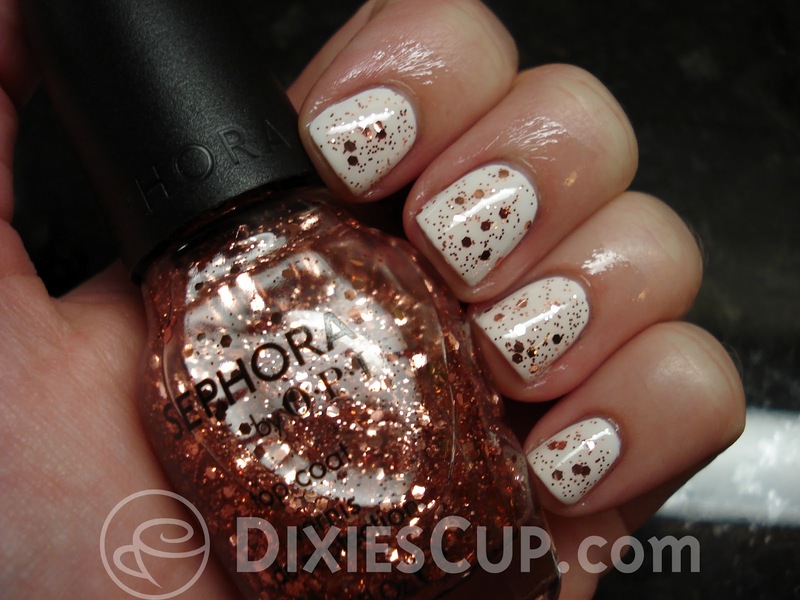 Of course the name Traffic-Stopper Copper indicates that the glitter is a copper color, but it also looks like a rose gold shade to me. As you all have likely noticed, rose gold jewelry has become quite popular recently, and I LOVE it. I may as well have some nails to match my jewelry, right? Yes. As I mentioned at the very beginning of the post, you have to fish this glitter out of the bottle. It is not very densely packed, so it is a bit of a pain to get on the nail. However, once you get the hang of it, you can get a decent amount of sparkles to cooperate. 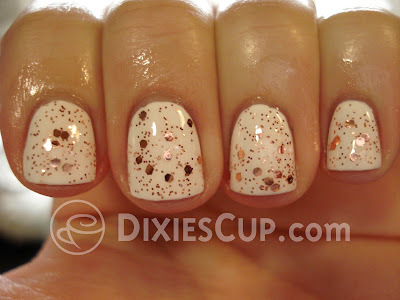 In all of the photos, there are two coats of the glitter and one coat of fast-dry top coat. You'll see better in the macro shots above and below that there are two different sizes of glitter: larger hexagonal glitters and smaller micro glitters.